1.0 Patch data file and old Turtle Ship, but with Userpatch features. 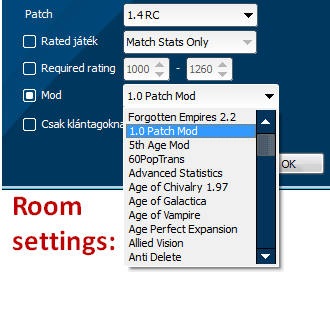 This mod can be played in RATED games. •	Aztecs lost free Loom. •	Byzantines lost free Town Watch. •	Chinese start with +50 food (-150 instead of -200 food). •	Franks lost the Halberd technology. •	Goth infantry cost -10% Feudal, -15% Castle, -25% Imperial Age instead of 25% less starting in the Feudal Age. •	Japanese infantry attack +10% faster Feudal, +15% Castle, +25% Imperial Age, instead of get 25% attack speed bonus starting in the Feudal Age. •	Korean villager LOS decreased by -1. •	Shinkichon increases Onager range by +2 instead of +1. •	Spanish Hand Cannoneer and Bombard Cannons are firing with normal speed. •	Scout Cavalry lost the +2 attack in the Feudal Age. •	All archery range units (except Hand Cannoneers) now do -1 damage to Spearman-line units. •	Camels are training slower (29 instead of 22sec). •	Cavalry Archer now have 3 range instead of 4. •	Removed Bombard Cannons's extra +80 damage to buildings. •	Galleys now take 45 sec instead of 60 to produce (War Galleys & Galleons take 36 seconds). •	Fireships & Fast Fireships -1 armor vs. Galley-line ships. •	Fireships not cause additional damage vs. Turtle Ships. •	Celtic Woad Raiders and Viking Berserks now move slower (1.03/0.9 instead of 1.2/1.05). •	Korean War Wagon cost -40 wood and range is increased by +1. •	Turtle Ship artwork restored to original. •	Bombard Towers now do normal damage instead of pierce damage (the major effect is vs. rams). •	Castles now take less time to build (150 sec instead of 200). •	Palisade walls -3 Pierce armor. •	Capped Ram & Battering Ram upgrades cost gold too (250/800). •	Loom provides -1 Pierce armor. •	Heated Shot now increases tower attack vs. ships by 50% instead of 125%. In addition not increasing attack for Castles, also not cause additional damage vs. Turtle Ships. •	Parthian Shot not increases Cavalry Archer and Mangudai attack vs. spearman-line units. •	Shipwright not decreasing ship build time. •	Theocracy cost increased by +400 food and +600 gold. •	Treadmill Crane, Masonry, Architecture, Hoardings, Fortified Wall, Guard Tower, and Keep wood or food costs replaced with stone. Fish traps now provide food at a slower rate (0.75 instead of 1.25).